Two years ago, I created my first free and downloadable journal to use in college level technique courses. It was well-received and used around the country in various courses. Today, I am pleased to share a second journal. Thank you to fellow dancer and graphic designer Jai Arun Ravine for the beautiful design work. And, thank you to Eric Kupers, Damon Rago, and Pamela Shoebottom for your insights into the journal prompts. As you plan for your own winter/spring 2019 courses, please consider using this journal with your students. I strongly believe in the power of a regular writing practice as a component of each and every undergraduate and graduate level dance class. A small but steady writing practice supports our dance work on multiple levels. I am passionate about the articulate dancer and reflective dancer. There are two PDFs to download here. The first is to "print at home." The second PDF is to use at a college print shop. As we head into another academic year (the 22nd year for myself! ), I have created a simple reflection tool for us all. Please join me! The three key words and actions here are: disrupting, deepening, and contextualizing. Disrupting - breaking out of our normal patterns for both teaching and for preparing for classes. Deepening - taking the good work we are doing and going further. Making experiences and relationships richer...more. Contextualizing - locating ourselves within a bigger picture. Keeping the work relevant and meaningful. I want to thank several colleagues for reviewing this and for offering feedback: professors Cynthia Oliver and Jan Erkert at the University of Illinois at Urbana-Champaign, San Francisco Bay Area teaching artist Todd Courage, and dance teachers Linda Carr and Valerie Gutwirth in the Berkeley Unified School District. Please consider printing this out, writing and reflecting , and sharing this with colleagues. Here's to a great year of learning ahead! Throughout 2017, we used the alphabet as a novel way to unpack the many concepts of arts administration. It was a lot more content than expected - with 180 terms and concepts explored and explained. Please join in. Arts administration relates to work at dance centers, arts councils, arts education programs, companies, and college programs. Please read on to explore the many and varied topics within arts administration. While not every topic applies to every setting, we hope that you will still find one or two ideas under each letter as useful and applicable to your particular setting. You are welcome to print out this PDF, but please note that the document is best used and read online to have easy access to links to articles, books, and blog posts. In Spring 2016, I developed and tinkered with this graphic organizer tool. I was exploring new ways of entering into a creative project with my 7th and 8th grade students. For middle school students, using a tool like this can offer a simple and concrete way for students to capture ideas and remember their options as they begin a project. It opens up possibilities and invites students in who like writing down ideas/visualized instructions. 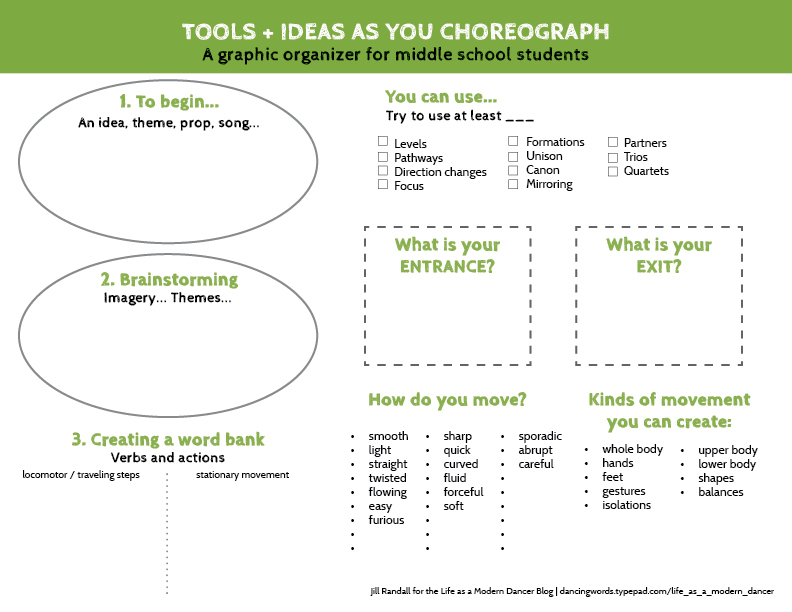 The graphic organizer is also handy from week to week to jog students' memories about their choreographic projects. As we gear up for the academic year ahead, I hope to offer some inspiration, ideas, and resources for college professors. All writing has been previously posted on this blog. The goal here is to gather this information in one place during the month of August. Here's to a great year ahead! This piece was originally published on January 28, 2015. I am excited to share this tool I developed for college undergraduates (as well as dancers of all ages). The goal of this simple survey is to consider the many jobs, roles, and tasks a modern dancer might have in 2016. Whether you are interested in performing, stage management, or teaching, this survey can help you consider the numerous and varied options. Evaluating your current skills, and skills to learn, will help you hone in on your specialty and areas of interest. College professors can use this as a tool with each student they advise as an assessment and conversation starter. Today I am thrilled to share two graphics that I have wanted to develop for years. Thank you to dancer and graphic designer Jai Arun Ravine for helping me finalize the ideas this week! A thank you also goes out to San Francisco Bay Area teaching artists Maurice Charriere, Patricia West, Juliana Monin, Valerie Gutwirth, Emily Miller, and Laura Marlin for their feedback. Here is an infographic and a graphic organizer related to the topic of "becoming a teaching artist." What are the skills, resources, and connections you will want to build? There are so many aspects to growing as a teaching artist to thoroughly and thoughtfully develop curriculum, relationships, and your teaching practice. The graphic organizer is a PDF with blank spaces to write down your own ideas and questions. Use the documents yourself or use within a college arts education course. There are 13 ideas presented here, which may feel like a lot. But as a field that lacks training, especially multiple courses as part of BFA programs, we have a lot to learn, see, and experience to become ready to head into a classroom or studio. One step at a time.....one topic at a time. Here's to a great school year ahead! Here's to a great spring semester ahead!